You only have to read some of the headlines to see just how poor as a nation we are at looking after our teeth. 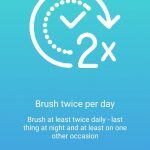 Even those of us who do brush the correct number of times a day and for the right amount of time, can likely make improvements. Are you holding your brush at a 45 degree angle to your teeth? I wouldn’t mind betting that you find yourself in that 68% who are not flossing as regularly as you should! How many times have you been to the dentist and have them say, you could brush a little better?! I am not here to critique you or guilt you into brushing better. You know whether you could be doing more or not. In an ideal scenario, to look after our mouths best, we would visit our dentist more regularly or just get better at cleaning our teeth. It is the latter that Brushlink, the product I am reviewing here, are focused upon achieving. Attaches to any manual or electric toothbrush. 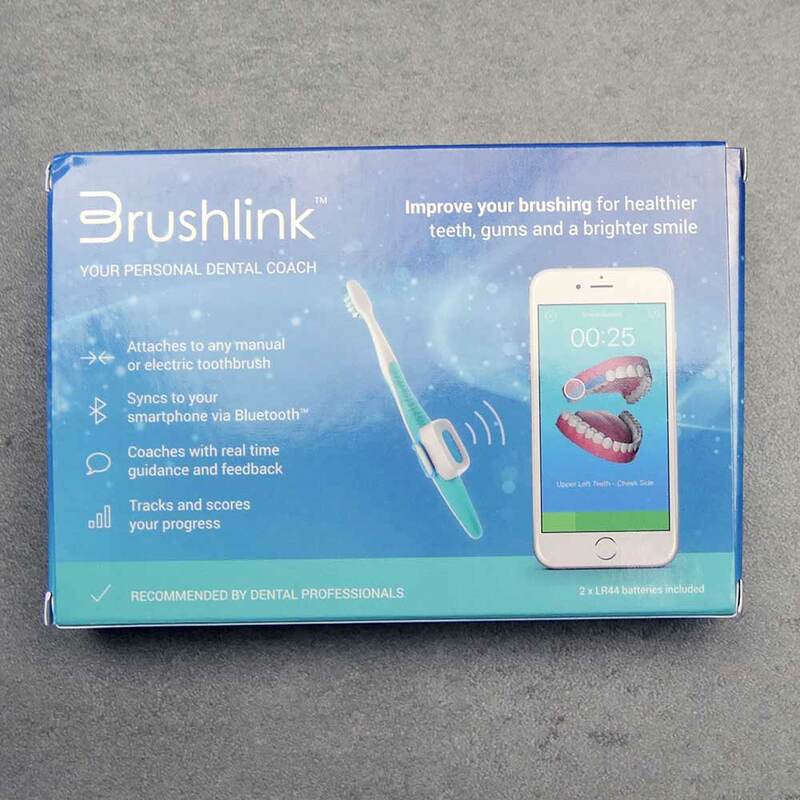 Syncs to the free award winning Brushlink App on your smartphone via Bluetooth. Coaches your brushing with real time guidance and feedback. Earn points over time and redeem them as dental discounts. 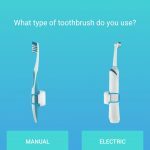 You may well be aware that electric toothbrushes are getting smarter with Bluetooth technology built in and various sensors to record how well you are cleaning. 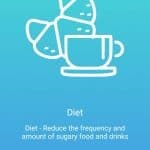 This data is transferred back to and stored within an app on your smartphone. I have reviewed many of them here at Electric Teeth, the Genius 9000 from Oral-B and Sonicare’s DiamondClean Smart are just 2 examples. Up until now, to gain this smart technology and tracking facility, you have had to buy an electric toothbrush with the functionality built in. Not only can this get expensive, you are too locked into the ecosystem of that brush manufacturer. 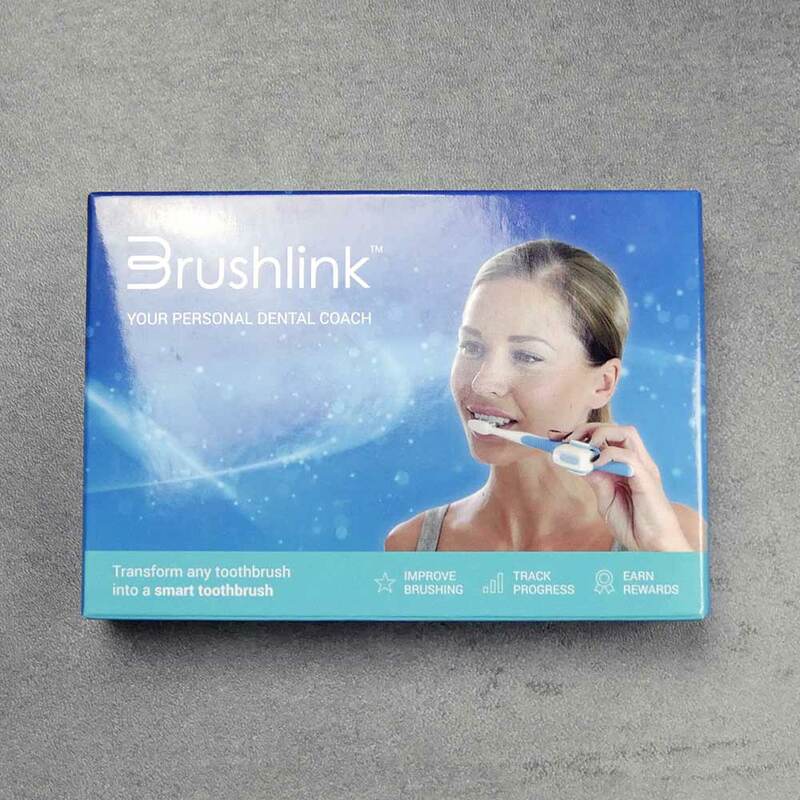 Brushlink is a novel solution that allows you to add this technology to your existing toothbrush as well as a new one. What is Brushlink and how does it work? 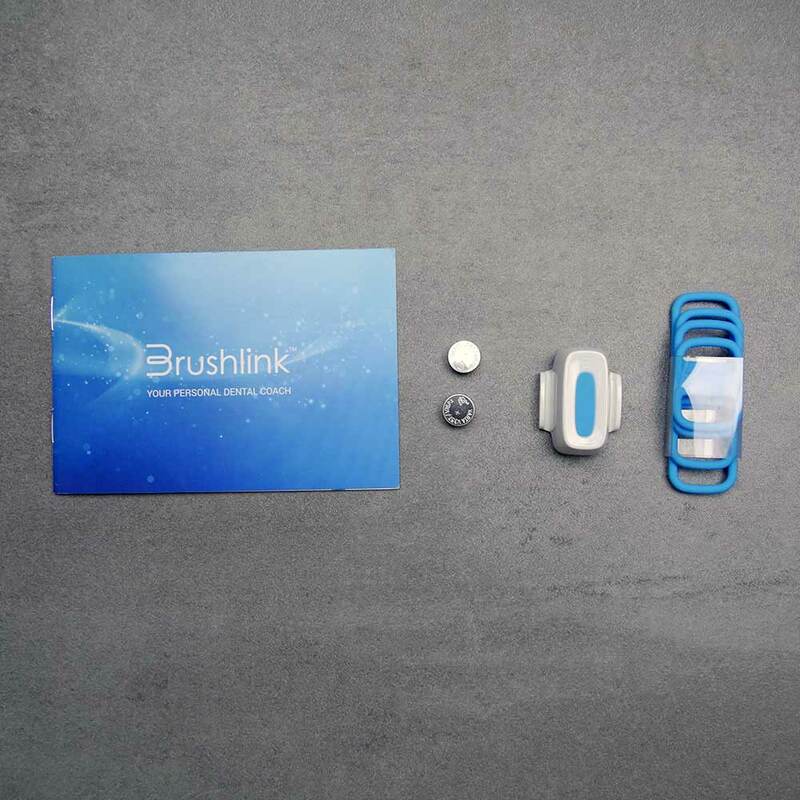 Brushlink is a smart module that fits to almost any toothbrush, manual or electric. 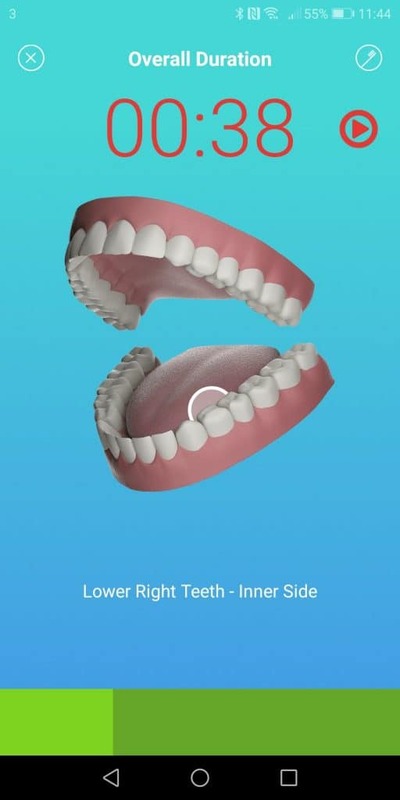 Using Bluetooth technology it transfers real time brushing data to a free smartphone app that you can view to learn how to brush your teeth better and achieve better oral health. It logs the data for you to review, but importantly for you to share with your dentist too. The more regularly and the better you clean, the more points you earn and the greater the potential for rewards. The principle is that a participating dentist or dental practice (hopefully yours) offers you the Brushlink module at no cost. In exchange you pay a monthly direct debit of £5. But, to counter this cost, your dental practice will offer a minimum of £100 in savings off products and services that they offer. 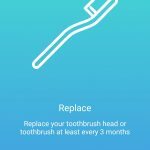 In principle the financial commitment encourages you not only to take more care of your brushing routine but is paid back in the savings you can make. You can however purchase the module on its own, direct from Brushlink and simply make use of the tracking and real time education it provides. You don’t have to pay the subscription fee. Brushlink explain and demo the product in the following video. What are the benefits and drawbacks to Brushlink? Universal design – Works with almost all electric toothbrushes. Manual or electric. 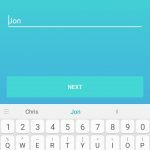 Simple to use – Well thought out and simple to use for a hassle free user experience. 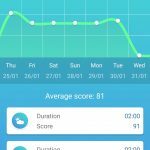 Professional coaching – Essentially like having a dentist watch and track your clean every time you brush. 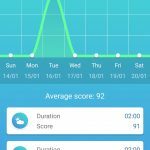 Link with dentists – The ability for dentists to track your cleaning history and offer rewards is unique and effective in achieving better oral health. Low setup cost – Much cheaper than buying a smart electric toothbrush. Size – A bit clunky on the brush handle and you perhaps need to adjust your grip. 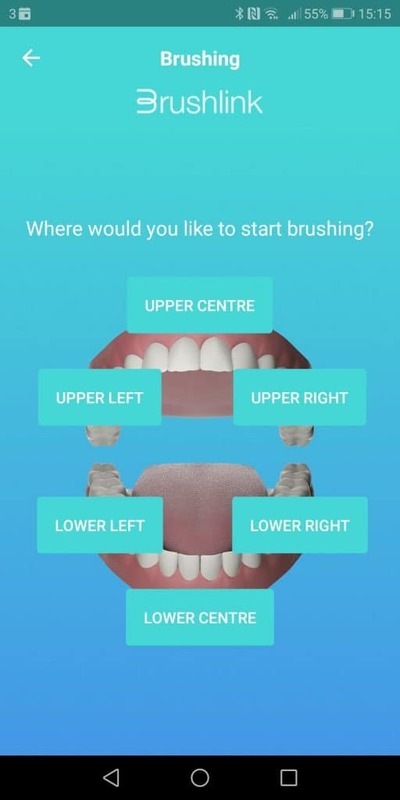 Pacing – App works on 6 key sections to the mouth, whilst many electric toothbrushes are paced on 4. Subscription model – Not essential but key to the long term success the £5 monthly fee might be too much for some. Availability – Dentists involved or supporting this are limited at the time of review. So what is Brushlink like to use on a day to day basis? Does it work? How does it compare to Sonicare and Oral-B? At the time of review, Brushlink is only a matter of months old. 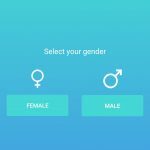 Launched in late 2017, I have to start off by saying how impressed I am at how slick the website is, the supporting documentation and the whole process given the company and the product is within its infancy. Innovative products like this often come as a result of crowdfunding campaigns. This has not and unlike many of those campaigns we see, this whole product feels more complete and that is likely in part due to the team behind it. Founded by Dev Patel (Dentist, not the actor) he has acquired some of the smartest minds to bring this product to market. You can find out more about them all here, but you have the benefit of dental and product creation experience to produce the module I am reviewing here. Even at his early stage the company has won ‘App of the Year’ at the FMC Dental Industry Awards 2017. I ordered online from Brushlinks website and paid £29.99 plus a £3 delivery fee. The ordering process was slick and it was delivered within a few days. Well packaged I like the tagline, ‘your personal dental coach’ and I love the simplicity with which it is setup. Included alongside the Brushlink module is an instruction manual that is one of the best I have seen. Well laid out, in colour with easy to follow steps, you almost want to read it. A lot of attention has been paid to ensuring you can get up and running with Brushlink in no time at all, and that shows. The module itself is just under 4cm in length about 3cm wide and 2cm thick. As a result it is not the smallest module to fit to the brush, but it is universal in its design, which is extremely appealing. 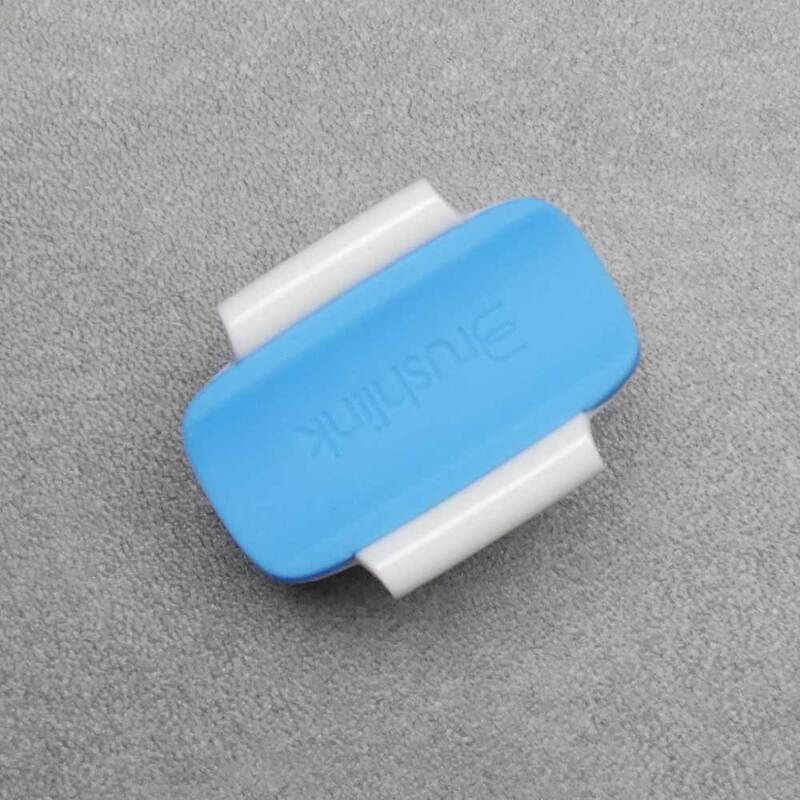 Using one of 4 different sized silicone bands provided in the box you strap the Brushlink module to the back of the brush handle, be that a manual or electric brush. 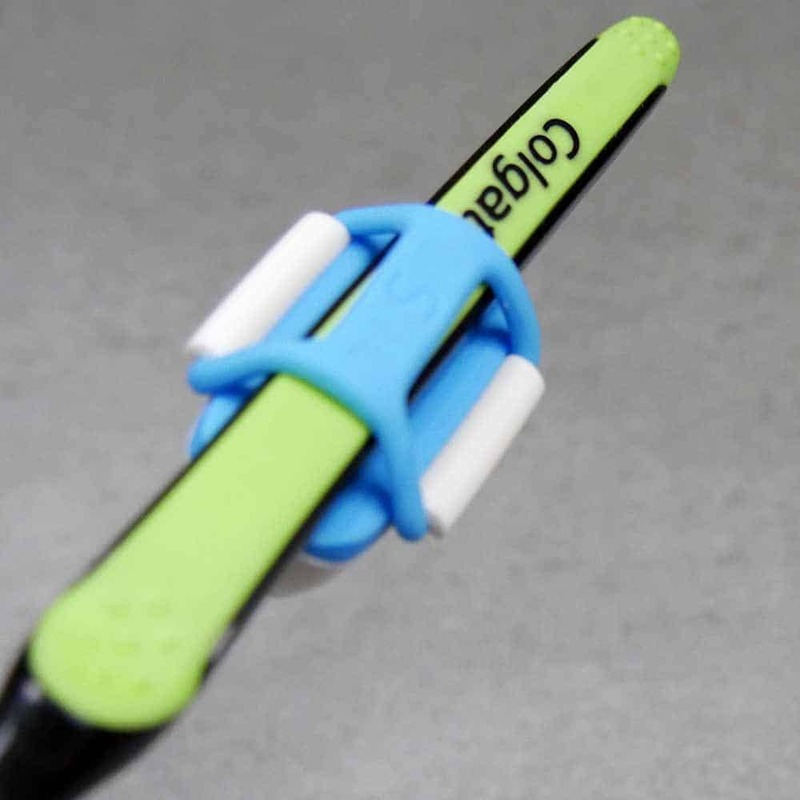 Depending on your brush will depend on what size band you need to use. For the sake of example on the Oral-B Pro range of electric toothbrushes I required the large (L) band. They take a few seconds to fit and there is a bit of stretch in them too. The universal design does too mean you are not locked within a particular brands ecosystem. 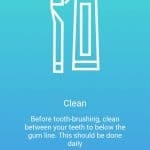 This means if today you use a manual brush, tomorrow you use an Oral-B electric brush and next week it is a Sonicare all you need do is fit the Brushlink product to the brush handle and you are away. With Sonicare and Oral-B the technology is built into the handle. I did find myself needing to adjust my hold/grip on the brush handle as a result of fitting Brushlink. It only took a few sessions to get used to the new grip. This module contains all the clever tech that tracks the position of the brush when you clean. 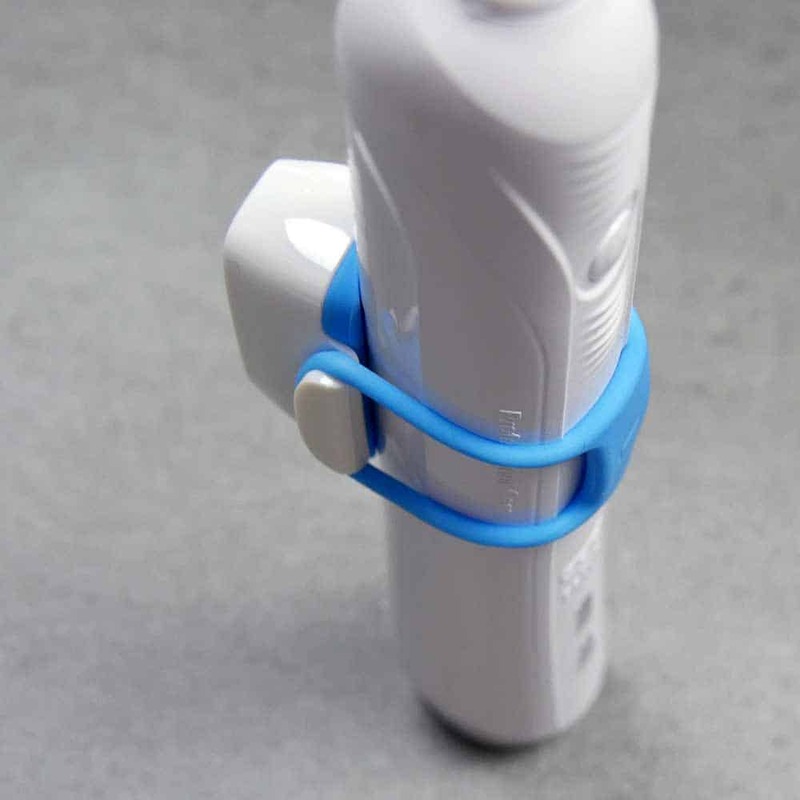 In smart toothbrushes the chip and sensor inside the module are built into the brush handle. Part of the bulk of this module is as a result of the 2 user removable batteries. I do wonder whether it could be made smaller by fitting a small user rechargeable battery in it. This does however bring its own problems, such as the need for a charging port. Brushlink uses Bluetooth to transfer the data in realtime back to the accompanying smartphone application. The smartphone application is free and available for Android and iOS devices. Download and installation is simple. There is an initial setup and pairing process that has to be completed as you might expect. This is painless and well explained on screen. Points to Brushlinkfor this. Each time you want to use Brushlink, you need to press the Blue button on the module, to switch it on. It is clever enough to know when the clean is over and will automatically power off. By switching on the module does not automatically launch the app on your smartphone, you need to do this manually. 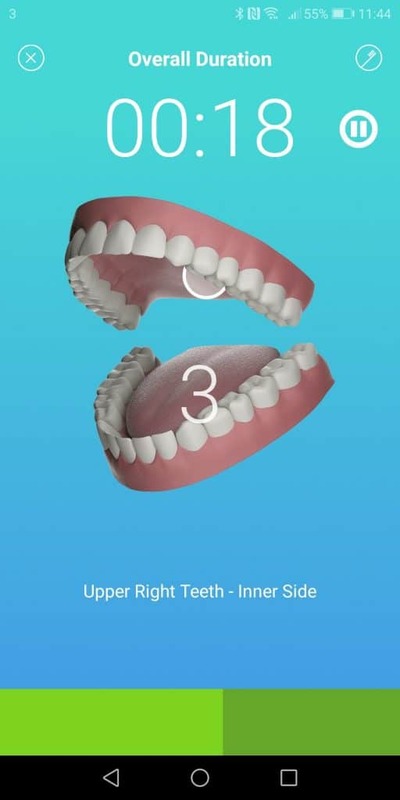 If you launch the app on your phone, then power on the module, within a couple of seconds the pair will have connected and be ready for brushing. You do not have to have the smartphone in range. 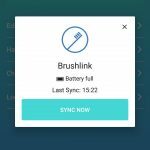 Brushlink will retain and track cleaning data and sync next time you connect to your phone. Of course in this instance there is no real time feedback, merely a log that you cleaned within your brushing history. This logging facility is useful, but when it came to syncing after a few days without connecting to a phone, I found it could take up to 3 minutes to sync and appeared on occasions to actually time out. This could be the fault of the app, my particular smartphone or the hardware, I am not sure. It is in the real time feedback that you get on screen where Brushlink really comes into its own. The principle of how it works and what it does is the same as Oral-B and Sonicare’s solutions. On screen graphics show you what area of the teeth you should be focusing on. The idea is that you mimic this in your mouth. Brushlink monitors the position of the brush handle and feedback is given via a Red, Yellow/Orange or Green bar at the bottom of the screen. The Green bar is what you want, this means you are brushing at the right angle. Yellow/Orange signals that you need improvement. Red means you have the incorrect angle. My hands on testing shows that most of the time Brushlink is accurate and quick to respond when the position is changed. So, if you have a Red bar, you make an adjustment and the bar switches to green almost instantly, no lag or delay. For a 2 minute clean you follow the on screen guide and at the end you get a score out of 100. Of course the aim is to brush as well as you can and get as high a score as possible. This scoring system converts into points. If you use in conjunction with your dental professional, the points equal prizes. 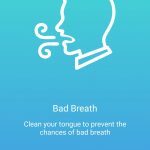 I should note on a couple of occasions the app/timer stopped mid clean, acting as is I had stopped brushing. I am not sure why. No error message appeared. Perhaps a bug that will big fixed. The biggest frustration or inconvenience with this timer and it’s configuration is that it was different to my current toothbrush. Built into my electric toothbrush is a quadpacer, which breaks the mouth up into 4 sections. You spend 30 seconds on each (upper right, upper left, lower right, lower left). The brush pauses at 30 second intervals to singal to change quadrant. 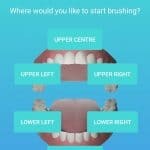 The app takes a slightly different approach, breaking the mouth and the brushing session into 16 areas. These relate to the main surfaces of the teeth. Front, back and biting surfaces. 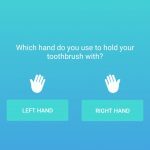 Now this is another common approach to brushing the teeth, but when the app and electric toothbrush are not aligned it can get confusing as two items are giving you different messages. 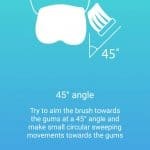 This means the app wants you to move the brush to a different position, which you would naturally clean, but the pace and flow is different it you are used to the quadrant routine. With some electric toothbrush models you can change or switch the pacer off, with others you cannot. This is not an issue if you have a manual brush. It might just be a learning curve to get over, but if you have spent years cleaning one way and now you have to adapt, that can be difficult. As not only are you trying to brush better, but brushing with a technique you are not familiar with. 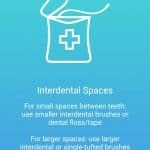 The general consensus amongst dentists appears to be that sticking to a routine you know, but improving the technique is better than trying to switch approaches altogether.I would like to see the app give an option for the more common quadrant paced cleaning setup. The app is really clean and simple in its setup and not overbearing. The principle behind Brushlink is to be your personal dental coach and for you to use it in conjunction with your dentist. 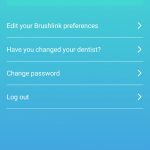 Whilst your dentist can get a pretty good idea of how well and regularly you are brushing just by carrying out an examination, the data that Brushlink provides allows for a dentist to give more focused care and advice for you to have better oral health. The extra data that this gives the dentist is very valuable as they can see via their portal exactly when you brushed, for how long and how well you did. The dentist can also adjust the timings for your clean if you need to spend more time focusing on certain areas. The idea is to be an educational tool and this option will set you back £5 per month. For this £5 fee, you should receive the module for free. Given that buying the module outright is £30, it will take 6 months subscription to cover the cost. In addition, the dental practice has to offer at least £100 of discount to you for taking part. Thus, the cost should be easily worth it in the discount. Whilst I am not a massive fan of the upfront fee, I think for many this cost is firstly small enough that it will not be considered expensive. You get other benefits in return and that fee is enough that you feel compelled and committed to try a bit harder at brushing. Therefore, next time you go to the dentist, you don’t get a telling off because you have been perfecting your brushing since your last checkup. For some, the financial commitment, big or small is a massive motivator to do better. It is like a gym membership, if we pay for it, we generally use it because we feel guilty if we do not. Oral-B are the biggest toothbrush brand promoting connected and smart toothbrushes. They have about 6 current models that offer such, compared to the 2 from Sonicare. We’ve written about these devices in our post: which electric toothbrushes have bluetooth? 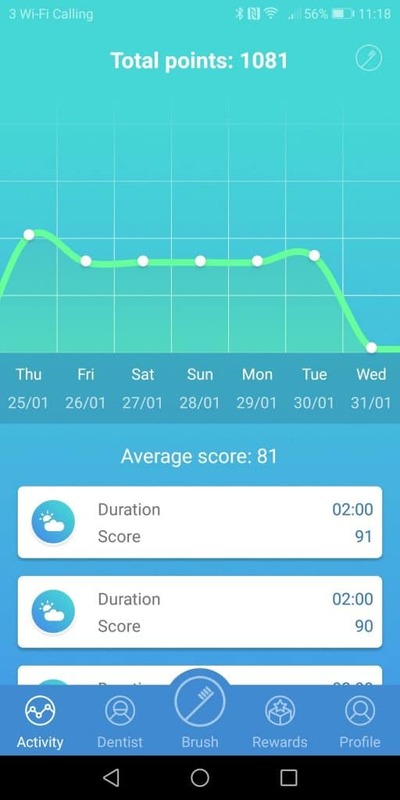 Whilst Oral-B have pioneered this market in some respects, I actually think Sonicare have done the slightly better job of their app implementation. Oral-B’s flagship for this technology is the Genius 9000, whilst Sonicare’s is the DiamondClean Smart. Whilst we prefer the DiamondClean Smart overall, because of the vast difference in price, the 9000 is actually what we recommend out of the two. Anyway, I digress. Having now used the Brushlink app I am very impressed with the minimal, yet functional setup offered. Both Oral-B and Sonicare apps are more complete. They can be a tiny bit complicated on first use. Lots of options and settings to look at. 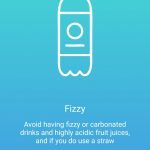 The do try to sell additional products via the app too, which is in part to be expected. Brushlink does not. However, there are features that I like and Brushlink could and really should add in. 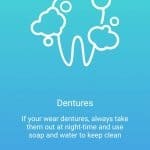 I think brush head reminders and specific dental journeys or plans are worthwhile. These can be controlled by you as a user. 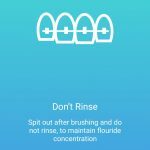 Prompts to floss or rinse with mouthwash might be worthwhile additions. Sonicare and Oral-B offer elements for dental professionals but they do not have the backend system that Brushlink does. The idea is of course to use this everyday, but you do not have to. It is up to you how frequently you use it. You might want to use it for a week, a month, maybe a month every 6 months, you have the choice. If you have perfected your cleaning approach, there is no harm to check in every now and again to make sure you are doing as well as you think. You could share it between friends and family. You can have only one user at a time, but if you are not using it, perhaps someone else can get value and better their oral healthcare regime. The ultimate aim is for you to have healthier teeth and gums. 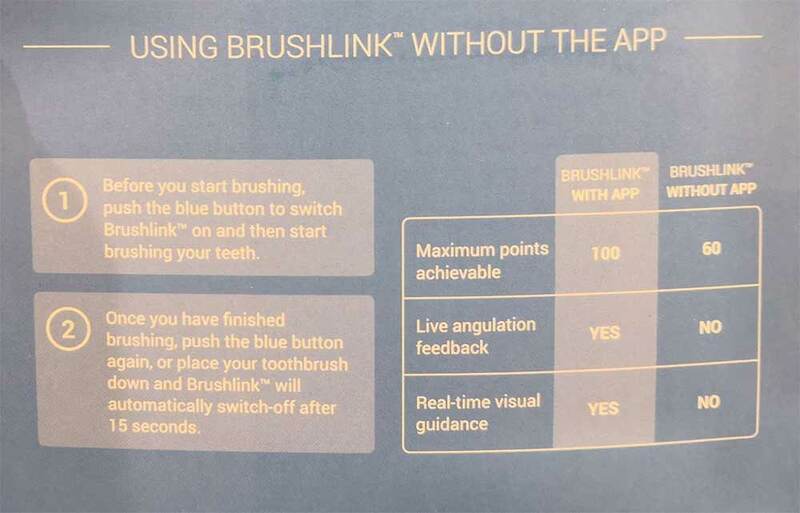 Another point to note it that to get best use from Brushlink you need the smartphone with you at the time of brushing. You either need to place this on a work surface or hold it in your hand as you brush with the other. This way you can see the screen and feedback and make the adjustments. Both options of holding it or placing it on a work surface are fine, but many I suspect would prefer some sort of dock included to place their phone, so it is visible when brushing but does not have to be held or placed in harm’s way. Whilst more phones are being made water resistant, not all are and some are wary about using a smartphone in the bathroom. I can see why Brushlink don’t include a smartphone stand or holder, but it might be a small addition you want to think about. Oral-B have with many of their models. You can generally pick up some sort of universal smartphone holder for less than £10. I can see how some might not want this in the bathroom though. Perhaps the answer to not have to keep glancing at the screen is some audible notifications and alerts from the app. 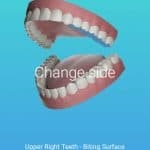 How about phrases like, “brush the top right teeth now”, or “adjust the angle”. “Good, better, perfect”. You get the idea. A novel feature which I like a lot and works really well, is the email summary that comes through once a week. It gives you your brushing stats and is a nice touch and another reminder to take care of your oral health. Whilst it is early days for Brushlink, initial feedback from dental professionals has been very positive and I second this. However, at present, those dentist and dental practices that support Brushlink are few and far between. 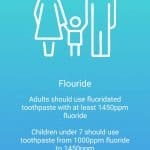 This will without doubt come in time, but more needs to be done by Brushlink to get dental practices on board as well as providing a list of dental practices that are indeed offering support for Brushlink so people like you and I can find those dentists supporting this innovative tech and ensure we are getting the assistance we need. With a plastic and rubber construction the unit is resilient to water and toothpaste etc. The components are well sealing inside, but it is by no means waterproof. It comes with a years warranty should it fail, but to keep the unit performing make sure the seal to the battery is securely in place and give Brushlink a wipe down if grime is building up on it. Supplied with Brushlink are 2 x LR44 batteries. These need to be inserted inside the module, by removing the Blue rubber panel that makes up the back/bottom of Brushlink. Once removed 2 placeholders for the batteries are clearly visible and labels mark which way up the batteries should be placed. It is a tad fiddly to fit, but within a minute or so the job is complete. Replace the Blue rubber panel that acts as a seal to the electronics inside. The batteries are fairly limited in their power draw. They power the unit for just over 2 minutes from when it is switched on to shortly after the clean is complete. It transfers the data in realtime to the nearby smartphone. Once complete the unit powers down and the battery life is conserved. These small batteries tend to be quite power efficient. How long they will last for I am not entirely sure. After a few weeks the ones supplied in the box are still going strong. I suspect you will get a good few month’s from them. When they do need replacing they are easily replaced. The good news is that within the app it does report back on the battery status. Thus you do get some warning as to when the power is low and they need replacing. This feature is a small but nice touch that adds an extra level of convenience. Brushlink has a retail price of £29.99 — you can buy it directly from the Brushlink website or here on Amazon. However, it is possible that you can get it for free via your dentist or dental practice, if they are partnering with Brushlink. To get it for free, you need to setup a direct debit of £5 per month, but you do receive in exchange for this financial commitment, at least £100 of savings per year from your dental practice. If you subscribe for a whole year (I believe you can unsubscribe at any time) you will pay £60 but get at least £100 back in savings, not to mention come away with the benefit of knowing you are brushing better and have healthier teeth and gums as a result. I paid for this outright, £29.99 plus £3 shipping. Whilst it has a warranty for a year I suspect it will work for several years, lets say 3, this works out at just £10 per year. At £10 a year given how it teaches and encourages you to brush better I think this is exceptional value. With dental bills often quite expensive, £30 is a small price to pay given that it may stop you having to go to the dentist as your teeth and gums are in a better shape! Can you put a price on better dental health, £30 seems to be it! There will be the extra cost of replacement batteries, but these should be a matter of pounds as and when they need replacing. 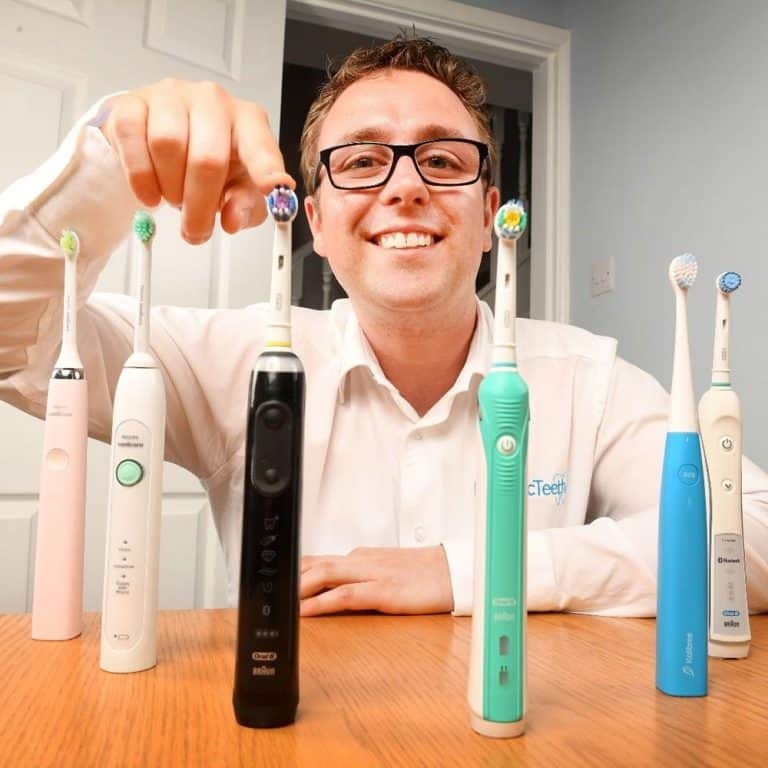 For the sake of comparison, those electric toothbrushes from Oral-B or Sonicare that have similar feature sets built in start at £50, with the average price being over £100. You can even pay nearly £300. Often with some of the smart brushes you do also get some other accessories, or value added items in the box for this price, but they are not always relevant or required. A reasonable but basic electric toothbrush will cost anywhere from £20-40, add on the £30 Brushlink and for as little as £50 you can have yourself a smart toothbrush. If you are using a manual one, it is even cheaper. With Brushlink you also have the universal and interchangeable design, which has to be worth something too, should you change toothbrushes. Your opinion and perception of value may well be different, but for me, I am impressed with what you get. buy it directly from the Brushlink website or here on Amazon. Brushlink is a new product, with no history or past products to make comparison too. Judging the long term reliability and use is difficult. I have been testing for a few weeks and all has been fine with no concerns from my side. A couple of issues with the app and connectivity, but I am convinced in time these will be ironed out. Only long term testing and more hands on use will really tell. The product looks and feels of a good quality. Whilst the back cover of Brushlink is removable it is a sizeable seal and the chance of water ingression is slim. Perhaps the weakest point are the silicone bands that hold the module on the brush handle. Whilst fairly strong and durable I suspect in time they can be lost or broken, but I suspect Brushlink will offer spares if required. It does come with a 1 year warranty which will give many peace of mind, should something go wrong. Having a smart or connected toothbrush is not for everyone. For those that do want such, there are a few choices, the majority of which come with an upfront cost that is considerably greater than Brushlink. 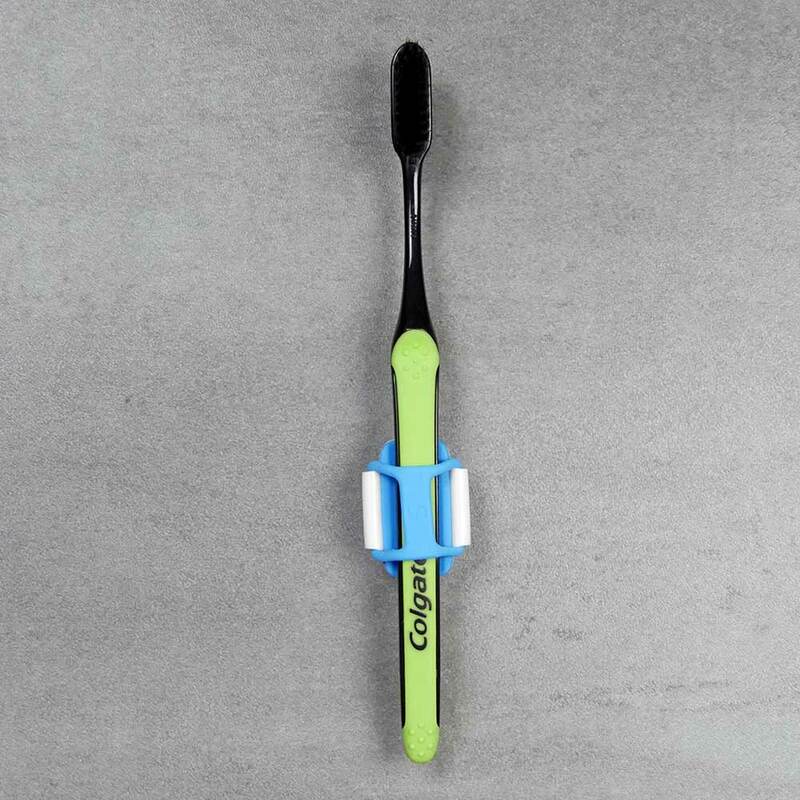 Brushlink is an interesting and appealing modular system that can be used across differing toothbrush styles and brands. As add-ons go this offers a lot and can be significant in improving your dental health. It can cost less than 1 regular dental checkup, but potentially save you hundreds on future dental bills. For me it is almost a no brainer. Best value ultimately comes when used in conjunction with a dental professional. 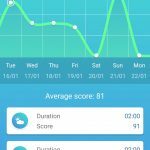 The app provides lots of great coaching, but real data and your dentists comments can take it to the next level. And that is where Brushlink is lacking at the moment — currently there are not many dentists on board. That being said, it has only just launched so it would be unfair to criticise it too harshly for that at this stage. We have given it a 4* rating in terms of performance, but the entire product offering does not quite warrant this until more dentists are participating. If regular use and financial commitment is too much, even occasional use will without doubt bring value. Gentle reminders of where your brushing needs to improve. Maybe you can finally tackle those bleeding gums!? Share it between your family or friends if you want. Just a few weeks use can make you a better brusher with visible improvement in the health of your teeth and gums. It is a product that could transform the oral health of the nation. With more adoption and perhaps small tweaks in software and hardware it might just be the best invention in the last few years that can take our oral health to better levels. Which electric toothbrushes have Bluetooth? Do you own or have you used Brushlink? Let us and others know what you think about this?